I think everyone and their mother knows David Yurman jewelry (my mother certainly does), so you will all be excited to learn that there will be a David Yurman sample sale starting tomorrow and running through Sunday, March 27. 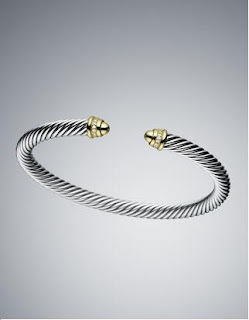 Since it's hard to find David Yurman discounted, the sample sale will afford some rarely encountered deals on the jewelry (though supposedly the DY outlet at Woodbury Commons offers comparable deals). The discounts are expected to be as follows: 30% off silver jewelry, 40% off gold jewelry, and a few items at 60-70% off. The sale is located at the Altman Building at 135 W. 18th Street. Sale hours are 3-8 on Thurs, 10-7 on Fri and Sat, and 11-5 on Sun. Good luck at the sale! Your wrists will be thanking me!